Performs and manages cardiopulmonary laboratory functions and activities for noninvasive diagnostic cardiac procedures, invasive diagnostic and interventional cardiac procedures, pulmonary function testing, diagnostic and therapeutic bronchoscopies, and respiratory therapy. Related DoD Occupational Subgroup: 300. Performs and supervises cardiopulmonary functions such as electrocardiograms, exercise stress testing, and ambulatory electrocardiographic monitoring. Assesses heart structures and flows via 2-D and m-mode echocardiography, Doppler, and contrast colors. Assists physician with transesophageal and stress echocardiography, and radionuclide and thallium studies. Interprets arrhythmias. Serves on cardiac catheterization (invasive) procedures teams. Assists in placing specialized equipment and instruments into cardiovascular system for diagnosis and therapy, including cardiac pacemaker and balloon pump insertion. Operates and maintains specialized equipment to evaluate respiratory or pulmonary functions, and respiratory physiology. Performs spirometry, flow volume loops, lung volumes, diffusion capacities, and closing volumes. Draws and analyzes arterial blood gas samples. Maintains quality control of arterial blood gas machines and CO oximeters, including proficiency testing. Performs broncho-provovation and exercise testing. Assists physician with fiberoptic bronchoscopy for diagnosis and therapy. 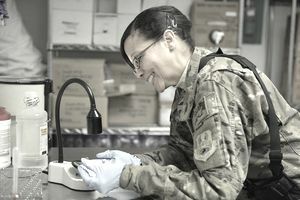 Under orders of a physician, administers respiratory care such as oxygen and aerosol therapy, mechanical ventilator management, and preparation and administration of respiratory medications. Assists physician with intubation and extubation procedures. Performs endotracheal tube care. Maintains patient airway. Ensures bronchial hygiene through incentive spirometry and specialized breathing instructions. Prepares and instructs patient to use equipment or perform procedure. Checks patient and equipment, and changes equipment. Monitors data display on physiological equipment and obtains and records vital signs. Performs cardiopulmonary resuscitation (CPR). Assesses and documents patient status. Performs user maintenance on equipment. Adheres to infection control and universal precautions procedures, including the disposition of contaminated materials. Practices safety and security measures. Performs cardiopulmonary laboratory administrative, maintenance, and support functions. Ensures equipment is calibrated to the manufacturer's specifications. Cleans, disinfects, and sterilizes (or prepares for sterilization) cardiopulmonary equipment. Operationally checks and inspects equipment. Determines inventory level of disposable supplies; stocks accordingly; and returns excess stock. Prepares equipment requisitions. Maintains CPR cart. Ensures emergency equipment is available and functional. Schedules patients for evaluations, procedures, and treatments. Obtains medical records. Greets patients and answers the telephone. Practices patient and coworker sensitivity. Assists with the transportation of patients to and from hospitals, and those in the air evacuation system requiring mechanical ventilation. Maintains general correspondence, files, records, and reports. Provides biometric data. Manages cardiopulmonary laboratory functions and activities. Develops staffing requirements. Determines work priorities, methods, and procedures. Develops operating instructions and determines policies. Prepares budget requirements. Evaluates, budgets, and justifies new equipment purchases. Establishes and maintains a publication's library. Ensures compliance with credentialing agencies' standards. Participates in and manages quality assurance and improvement (QA&I) efforts. Directs on-going continuing education and in-services, developed in part from QA&I findings. Ensures implementation of disaster and emergency plans, as well as safety and security. Collects, analyzes, and reports biometric data. Processes collected data for physician interpretation. Knowledge is mandatory of: general anatomy and physiology; cardiopulmonary system structures and functions; basic pharmacology; patient care theory, procedures, and techniques; medical terminology; aseptic techniques; medical ethics; resuscitation techniques; maintaining and operating cardiopulmonary laboratory diagnostic and therapeutic equipment; medications; and medical computer systems, readiness, and resources management. For entry into this specialty, completion of high school or college courses in algebra and chemistry is mandatory. 4H031. The apprentice cardiopulmonary laboratory specialist course. 4H051. The cardiopulmonary laboratory specialist (phase II) course. 4H051. Qualification in and possession of AFSC 4H031. Also, experience performing diagnostic and therapeutic procedures to care for and treat cardiopulmonary laboratory patients. 4H071. Qualification in and possession of AFSC 4H051. Also, experience performing or supervising diagnostic and therapeutic procedures to care for and treat cardiopulmonary laboratory patients or operation of cardiopulmonary and respiratory equipment. 4H091. Qualification in and possession of AFSC 4H071. Also, experience managing diagnostic and therapeutic activities involving patient care and treatment.